The Tracer is a new type of computer mouse that you control with your head. Compared to others, it is the most accurate and responsive, best featured, and best valued head pointer available. Sound too good to be true - click here to find out how we do it. Tracer gives mouse control to people with Quadriplegia, CP, MD, MS, ALS, Carpal Tunnel Syndrome and any other disability where you lack the hand control to use a standard mouse but retain good head movement. Tracer uses a small gyroscope to sense the user's motion. 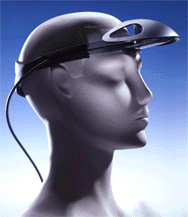 The gyroscope communicates wirelessly with the computer via an FCC Certified RF (radio frequency) connection, which solves all of the problems of the IR (Infrared) connection used by all the other head pointing devices. Boost Technology has become the supplier of choice for GiveTech, a charity that purchases assistive technology for people who could benefit from such technology, but who cannot afford it.